On December 18, NASA’s newest Tracking and Data Relay Satellite (TDRS-K), arrived at Kennedy Space Center (KSC) in Florida aboard a military aircraft from Los Angeles, in preparation for a January 29 launch. “This launch will provide even greater capabilities to a network that has become key to enabling many of NASA’s scientific discoveries,” says Jeffrey Gramling, project manager for TDRS at NASA’s Goddard Space Flight Center. TDRS-K, the next addition to NASA’s constellation of Tracking and Data Relay Satellites, is scheduled to launch atop an Atlas V rocket from Cape Canaveral’s Complex 41 on January 29. Its arrival at KSC officially started the launch campaign for TDRS-K, which will include final testing, the loading of maneuvering propellant, and insertion in the rocket’s fairing. All those activities will be carried out in the spacecraft preparation facilities at the commercial Astrotech campus, not far from KSC. Once TDRS-K is put atop the Atlas V conic nose, it will be transported to the rocket’s assembly hangar on January 17 for mounting on the launcher. While the TDRS-K is prepared, the Atlas V will be stacked at the Vertical Integration Facility aboard a mobile launch platform. On January 3 and 4 the first stage will be erected and, after insertion of the interstage, the Centaur upper stage will be mounted. 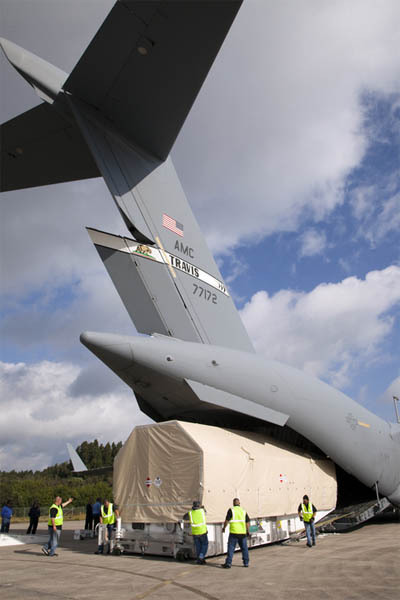 TDRS K is unloaded from U.S. Air Force C-17 on December 18 (Credits: NASA). The launch was postponed from December 13 to the new target on January 29 due to an investigation into the RL10A-4-2 upper stage engine. In October a similar engine (RL10B-2) carried by a Delta IV’s second stage experienced a low-thrust condition. Although the RL10B-2 is still under investigation, the RL10A-4-2 has been cleared for use. 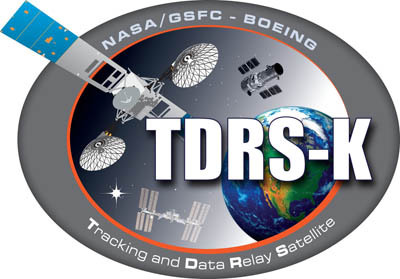 TDRS-K is designed to be function in geosynchronous orbit, relaying communications from the International Space Station, the Hubble Space Telescope and a range of other satellites in low Earth orbit. The system enables the flow of information up and down between the orbiting spacecraft and ground controllers at the White Sand Complex in New Mexico and in Guam. NASA started the deployment of the TDRS constellation in 1983 with the maiden flight of Space Shuttle Challenger. From 1983 to 1995 seven satellites, comprising the 1st generation of TDSR, were built and launched, although the second of the series was lost in the 1986 explosion of Challenger. Between 2000 and 2002, NASA launched the 2nd generation of TDRS, with three new satellites, not only to keep its preeminent communications relay system functioning, but also to increase its capabilities. TDRS-K will be the first satellite of the 3rd generation, followed by TDRS-L in 2014 and TDRS-M in 2015.